Pictures speak a thousand words, so I’ll let them give you a sneak peek. Here’s a visual tour of the places we’ll cover in this road trip itinerary across the Czech Republic’s scenic south. All great Central European itineraries start in Prague, the Czech Republic's capital. Take a few days to explore the city's most iconic landmarks - the Charles Bridge, the historic old town, and this view from the Prague castle complex. Hluboka castle in South Bohemia is Czech Republic’s most beautiful castle. Made in the style of England’s Windsor castle, this 19th century castle will surely evoke romantic memories. Just a few kilometers further south, you’ll find Holasocive, a small charming European folk village, with a somewhat grim past. Just when you thought you've seen the best of Czech Republic, you stumble upon this view. Cesky Krumlov is absolutely gorgeous and not to be missed. Cesky Krumlov is home to rich traditions, including gingerbread-making. As you drive through the south heading east, you'll come across South Bohemia's pretty Renaissance towns. This is Trebon, a great stop-over for a lunch of carp. Next comes Telc, with one of the Czech Republic's most beautiful squares. The rest of the town is just as charming. Mikulov is South Moravia’s very own castle town, a great base when exploring the gorgeous Lednice-Valtice Cultural Landscape. South Moravia's vineyards and nature trails are certainly a relaxing sight. You might just want to stay for longer. The South Moravian region is also great for hiking. You can climb up the tabletop mountain Klentnice for breathtaking views of the countryside. If you're visiting during the beginning of fall, check out some of the wine festivals happening all around the region. The Moravians sure know how to celebrate! Finally, we say goodbye to the Czech Republic and continue our European journeys to Vienna, Austria's capital. Don't forget to check out the road trip itinerary that goes from Vienna to Salzburg! Got you lusting for a road trip through the Czech south yet? Download a PDF guide here to help you quickly plan this trip! All great Central European itineraries start in Prague, the capital of the Czech Republic. Its most iconic landmark is Charles Bridge, a 13th century stone bridge decked with statues of saints, connecting Prague’s two most historical towns across the Vltava river. The bridge and the Prague castle (the largest ancient castle in the world) are enough to make braving the hordes of tourists worth it – but Prague’s got a lot more to offer, especially around the edges. Spend about 2 to 3 days exploring the city. Prague has such a long and rich history that every street will tell you a story. The Old Town and Lesser Town seem to have been frozen in the medieval ages, while the New Town continues to live up to its name and just gets glitzier every day with new shops and restaurants. The quieter neighborhoods of Vinohrady and Karlin keep up with the influx of tourists and expats by churning out cafes and bars that keep the drinks scene interesting. You can find an extensive walking tour of Prague here as well as in the PDF guide. Check here for hotel recommendations – you can take a fun quiz that will instantly help you choose the perfect Prague neighborhood, so that’s one thing off your to-do list. Once you’ve had your fill of Prague, get your rental car and begin the drive south. Hluboka castle is, simply put, the Czech Republic’s most beautiful castle. While this declaration may be largely subjective, I’m pretty sure you’ll agree when you see it. Many castles have been built on the site since the 13th century, but its current appearance was constructed in the 19th century in the romantic style of England’s Windsor Castle. You can stop by the area for an hour, take a walk around the castle gardens, and have lunch at the nearby café. Just a few kilometers further south, you’ll find Holasocive, a small historic village with a photogenic row of Baroque houses. It’s deemed a UNESCO World Heritage site as an example of a quaint well-preserved traditional European folk village, but the story behind why it was so well-preserved is a little more on the grim side. In the 16th century, Holasovice’s population was nearly totally wiped out by the bubonic plague. Only 2 villagers survived and it took half a decade to raise the population to 17. In the following centuries, it became home to a German-speaking community. After the World War 2, the German residents were driven away and Holasovice became a deserted village. It was only in the 1990s when the village was restored and inhabited. We visited Holasovice on an off-season (a rainy October weekend) and found the village almost deserted. This was perfect for us, though, as we wanted to take pictures of the Baroque houses. You can also find a self-guided tour of the village here. Our next major stop is Cesky Krumlov. Despite being offered as a day trip from Prague or Vienna, this place is worth at least a night’s stay – if I had my way I’ll stay here forever! Visiting Cesky Krumlov is like time-traveling and stepping into a medieval castle town. The polished cobblestones are a testament to the centuries of foot traffic that has kept the town a gem of the South Bohemia. The town itself is built on the banks of a particularly twisty section of the Vltava river, which means you can’t see far in front of you, making every turn a surprise. You can walk around the old town and visit most of the interesting sites in a day or two. Afterwards, if the weather is nice, you can spend another day hiking around the surrounding Blansky forest. Once you manage to peel yourself away from Cesky Krumlov (good luck! ), it’s time to ride through South Bohemia and onto South Moravia. South Bohemia is filled with small historic towns established in the medieval ages and well-preserved even throughout the tumultuous political and social upheavals. Seen in almost all South Bohemian towns are rows of colorful burgher houses decking beautiful town centers. Our first stop-over is Trebon, a small Renaissance town established in the 12th century. Since the medieval times, its inhabitants have turned the naturally occurring swamps and wetlands in the region into a system of lakes and ponds. As such, Trebon became the largest producer of freshwater fish in Europe, the most famous product being the Trebon carp. Trebon is a great stop over for lunch. We highly recommend the Restaurace Bily Jednorozec, one of the best restaurants we ate in while in South Bohemia. It was a great place for a couple of meat-lovers, but I imagine even vegetarians will revel in the freshness of the produce. If you eat here, you have to try the carp soup! You can find this place at Zizkovo namesti 46, or follow the Google map above. Trebon is home to spas, a gorgeous countryside, and lots of lakes, so if you’re up for a quiet, relaxing holiday, Trebon may merit more than a quick stop-over. Make the most of Trebon’s small-town charm by staying in a charming guesthouse like Penzion Admiral. For something a little bit more romantic, check out Design Hotel Romantick. Of all the Bohemian towns, though, Telc wins at having the most beautiful town square – even the UNESCO World Heritage list thinks so, too. An Italian Renaissance castle forms the center of the city, surrounded by more Renaissance and Baroque burgher houses from the medieval ages, and facades that reflect many centuries of varying architectural styles and aesthetics. Furthermore, Telc managed to escape the “mania for over-restoration of the 19th century” (UNESCO’s words), giving us an authentic glimpse of the original townscape. This is another great place to stay for a night, should you have more time to spare in your Czech Republic road trip. Telc has a handful of nice hotels like Hotel Telc and Penzion Danuse, both within walking distance of the castle and the town’s notable ponds. But if your holidays are limited, have a quick early dinner in Telc (we loved Zach Restaurant which was right in the middle of the town center), stretch out your legs and take photos of the gorgeous town center, then continue driving on to Brno. The roads in the south of Czech Republic are lined with vast agricultural lands punctuated by the occasional storybook town dominated by a church tower or a chateau. Once you reach the Moravian region though, the corn fields give way to vineyards. You have officially reached the Czech Republic’s biggest wine-growing region! There are two ways you can explore South Moravia. You can either go straight to the countryside to revel in the natural landscapes and bottles of wine, in which case you can choose Mikulov or the Lednice-Valtice Cultural landscape as your base. Or, you can spend some time in South Moravia’s capital, Brno, where you can get to know a hip and modern side of the region. If you’re into modern architecture or just generally like city comforts like gorgeous hotels, cozy cafes, and upscale (but ridiculously affordable!) restaurants, I’d personally recommend spending at least a few days in Brno first. After several days traversing the Czech Republic’s countryside, Brno is a very welcome city break. Prague may have the Charles Bridge, but Brno has – dare I say – some of the country’s best restaurants and cafes. One more point for Brno is that compared to Prague, Brno’s prices are way more affordable! You’ll be surprised at how far your Czech crowns will go. Spend a day to visit some of Brno’s top sights – the Petrov hill, the Spilberk castle, its two historic squares, and the underground labyrinth – then go on a café crawl or an architectural trail. You can find a more in-depth guide to Brno here. After your city break, head to Mikulov, the perfect base for your road trips around the South Moravian countryside. Not a lot of people know about South Moravia, but it’s one of the most beautiful places in Europe, especially for nature lovers. If you love to stay active while on holiday, South Moravia has a lot of beautiful hiking and biking trails that will take you through vineyards, castle towns, ruins, and scenic peaks! To help you get a better feel if this destination is for you, you can read more about my experiences in South Moravia here. If you only have 2-3 days to explore South Moravia, I’d suggest that you make Mikulov your base. Most biking and hiking trails run through here, and of all the towns in the area, Mikulov is the most convenient one. You’ll find the most number of shops and restaurants here – but don’t worry, it’s still pretty rustic so you get to enjoy all the perks of the countryside life. The beginning of fall (August to September) is a particularly great time to travel through the region. This is the harvest time for most of the wine variants grown in the area, which the Moravians celebrate with much enthusiasm in their almost weekly wine festivals. You can try the region’s specialty, burcak or young wine, during the harvest season. Or, if you’re traveling outside these months, get a bottle of Palava to get a special taste of South Moravia. Stay in Hotel Golf Garni or Ubytovani Merlot in Mikulov and enjoy the castle town’s laidback vibe. Finally, it’s time to leave the Czech Republic and drive to Austria – although it won’t be a long goodbye because less than half an hour from Mikulov, you’ll already be crossing the border to Austria! Check out the best things to do in Vienna and where to stay. These guides cover not only the essential must-sees but also some pretty neat local hangouts. 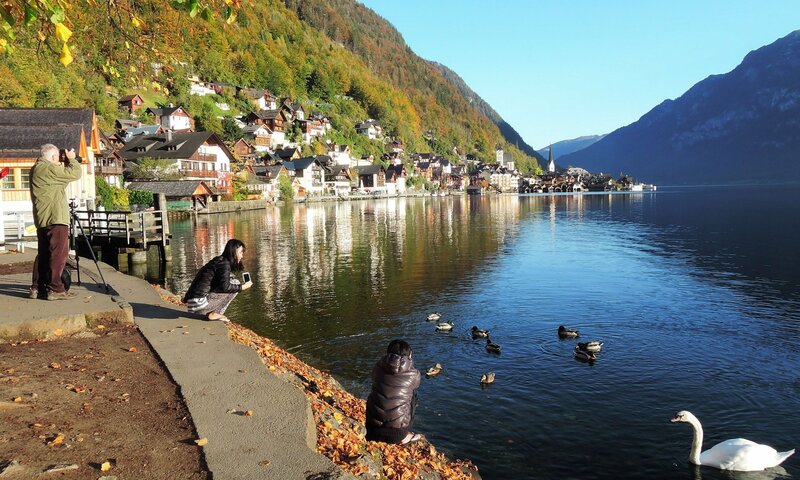 Continue your travels across Austria with this road trip itinerary that goes from Vienna to Salzburg – or if you’re short on time, just visit the highlight: Hallstatt. You can reach Prague by plane (check for flights to Prague), by train (check for train routes to Prague), or bus (check for bus routes to Prague). Rental car companies – Check for rental car rates and pick-up locations in Prague here. If you need an automatic transmission car, make sure to reserve at least a month in advance as the Czech Republic mostly drives manual transmission cars. Toll stickers – If you want to use the tolled motorways, you will have to purchase a toll sticker. You can get this from border posts, post offices, and petrol stations. However, note that when we did this road trip itinerary, we didn’t have to use any of the tolled motorways. Personally, the national roads that go through the towns and the countryside are just fine. Set your GPS (like Waze) to avoid tolls if you want to do the same. Read more about Czech toll stickers here. Parking – When driving around towns, look around for designated parking spaces. Check how long you can park your car and pay the necessary fees to avoid getting towed. Don’t drink and drive! It may be tempting to try out the country’s world-class beers and wines, but have a designated driver who won’t be drinking for the day. Driving from Prague to Cesky Krumlov can take about 3 hours without stops (170 KM). Day 3: Start your drive early. Stop by the Hluboka castle, then drive directly to Cesky Krumlov. Explore Cesky Krumlov. Day 4: Drive from Cesky Krumlov to Brno or Mikulov (choose one: Brno if you like city scenes; Mikulov for a relaxing countryside stay). Stop by Telc for lunch and a quick visit. If there are still some aspects of this itinerary that you’d like to know more about, feel free to send me an email and I’ll do my best to assist! I know how overwhelming planning a cross-country road trip can be – believe me, I’ve been there and it still happens to me all the time. Too much information can be a bit paralyzing, so I made a super simple PDF guide that will walk you through the process of crafting your road trip itinerary and booking all the necessary arrangements. I have separate travel guides for the cities and regions we touched on in this itinerary – you can go through them for more in-depth information. This is the perfect complement to the road trip itinerary from Prague to Vienna – continue your travels to Austria’s second city, Salzburg, through the equally gorgeous Austrian countryside! I hope this guide brings more travelers like you to the less-explored areas of the Czech Republic. There is really much more to this gorgeous country than Prague! Lastly, if you found this useful, please share with your friends or on social media so more people can find it. That would be much appreciated! Thanks so much for reading and happy travels to the Czech Republic! Thanks, Tom! Really appreciate it. And it was difficult to take bad photos in the Czech Republic – the country is amazing! Wow, rhis itinerary is incredible and detailed! Thank you so much. My daughters and I are going to Europe for the summer and we really want to get brave and rent a car to really see things and this makes it seem so possible. I really appreciate all of the information. Hi Alice, thanks so much for reading! I had a lot of fun doing this drive and it’s my way of sharing destinations around the Czech Republic beyond Prague. A few years ago I drove from Vienna to Salzburg, and it was my first time to drive abroad! I got so addicted to this way of discovering new places, and road trips are pretty standard now for me when traveling abroad. I’m glad that you find it helpful, and if you do push through with it, I’d love to hear about your experiences. 🙂 Thanks again! Hihi! I haven’t driven overseas and am planning my first as part of the Czech-Austria trip coming up this June. Quite simply, how was it driving on the Vienna-Salzburg- traffic, general route etc. Hi Luna! The Vienna-Salzburg route was my first overseas driving experience and it was great! Roads are smooth and easy to navigate (use Waze or the GPS in your car), fellow drivers are generally nice and predictable (meaning everyone follows road conventions and right of way, so as long as you also familiarize yourself with those, you’ll be fine). Bring sunglasses though – the A1 road from Vienna to Salzburg faces west directly so the sun will be blinding you almost the whole trip if you do it in the afternoon. I don’t remember encountering much traffic. You can email me if you have more questions – hello@littleholidays.net. Have fun! Thank you for posting this! I think I will be making this trip in July. I have already seen Salzburg, so I go from Vienna onto Budapest. Thanks! This is a bit late, but thanks so much for this post! Stealing this itinerary for my trip next week, this is perfectly planned. Much appreciated! I am keen to do a road trip but I would like to know if its possible to pick up the rented car from Prague and then drop it off at Vienna/ other parts of Austria / even Slovenia? It is possible to rent a car from Prague then drop it off at Vienna – you can look for car companies that provide a one-way service here and reserve your car online in advance; select the “drop car off at a different location” option. I tried looking for cars that you can get from Prague / Vienna and return in Ljubljana, but there doesn’t seem to be any car companies that allow this. You can consider driving from Prague and returning the car in Graz, Austria, before taking the train to Slovenia and getting another car there, though.